There are lots of reasons to be cheerful about the world, many the result of human creativity - the difficulty is remembering not to be miserable. Jeffrey Smart is one of several great living Australian painters who have continued the success of their now-deceased role models in carrying our unusually productive little nation's name into the international world of art. Among the illustrious dead are such names as Sidney Nolan, Russell Drysdale and Arthur Boyd. Among the resplendent living are Margaret Olley, John Olsen, and Jeffrey Smart. They are all getting on in years but they have that unquenchable sprightliness that painters so often seem to have, possibly because they lead more enjoyable lives than writers. This last opinion of mine might have something to do with my own temperament. My feeling that I would have been a happier man if I had been a painter and indeed a happier man if I had been a gravedigger - a very useful occupation, in my view, as it was in the view of the gravedigger who met Hamlet, himself a gloomy fellow - that feeling might have something to do with a disposition towards melancholy. From the inside I don't actually feel like a wet weekend. But apparently I strike other people that way. This raises large questions about our responsibility for the image we project: questions that I propose to address from time to time in this next, intensely serious series of 10 programmes. Have we a duty, for example, to paste on a smile and reassure the young that life is worth living? Recently I published a large book whose name I won't mention here, and it has been reviewed in all the English-speaking countries, sometimes by reviewers whose names I won't mention here either, until my security staff have rounded them all up and consigned each of them individually to a glass tank full of small undernourished Siamese fighting fish. But some of the reviews were gratifyingly thoughtful and one of the most thoughtful was by that sparkling young British journalist Johann Hari, whose work you may have seen, and if you haven't you should. Although he holds certain political opinions that I don't share - he was careful to point these out in case I had forgotten them - I thought his reaction to my book was a good part of the reward for having written it. To inspire such keen interest in a bright young person is surely part of my mission when dusk falls on the glittering city and I don the tightly fitting costume of the caped cultural critic to go swinging high above the teeming streets on the lookout for fallacious arguments to counter and damsel-like humanist values to rescue from durance vile. So I took advantage of the marvellous new technology and added Johann Hari's review of my book to my website, whose name I can mention because it's not a business that makes money. Anyway, clivejames.com now features, in its "recent books" section, a link to Johann Hari's review as posted on his personal website. But at the bottom of Johann Hari's review there is another link, provided by himself, which leads you to a piece he wrote when he was even younger, as if that were possible. Most people younger than him can't write at all except with crayons, but apparently he once interviewed me. No doubt dragging his school satchel, he turned up at my place expecting to meet the sun-soaked spirit behind the merry columns, programmes and articles that he claimed to have been enjoying ever since he was a child, several minutes previously. I read on past the second paragraph of this interview and I was suddenly appalled. The encounter had taken place about five years ago and obviously it had depressed him deeply, perhaps permanently. The picture he painted of me was of a desperately unhappy and self-questioning paranoid sad-sack. After that it got less funny. It seemed that I not only had to fight back tears as I choked out my defensive answers, but that I started to bleed spontaneously from the scalp. Across the years I think I can dimly remember that when he rang my doorbell upon arrival I brained myself as usual against the sloping roof of my study but it could well have been the result of one of those occasions when I open the refrigerator door to get out the butter that I'm not supposed to have, drop it on the floor, and then stand up suddenly without having remembered that the door is open. Well-adjusted people don't do that sort of thing even once. No wonder I had forgotten ever reading the interview, let alone giving it. It was a wonder that I hadn't gone somewhere shortly afterwards to lie down in a bus-lane. Unfortunately for me, reading the piece now, I can see that my disappointed young admirer quoted me accurately and that every impression he reported was soundly based. I'd like to think that he caught me on a bad day but I'm afraid that he caught me on a typical one. If that's the way you come over, that's the way you are, and as I speak to you now I am consumed with this latest reinforcement of a recurring notion, the suspicion that I don't spend even a tenth enough time recording the fact that I actually do enjoy those features of existence that don't drive me to mumbling pessimism. And so I ought to enjoy them. I'm well aware that I'm a lucky man leading a lucky life, at a lucky time in history blessed with the presence of penicillin, painless dentistry and Team America on DVD. I do feel gratitude and I ought to show it. But somehow I lack the knack for that. If young Johann is correct, even my jokes drip acid rain. It can't go on like this, or the carbon emissions from my personality will cause the wheels of baby carriages to rust in the street. So let me promise that from this moment I will try to generate the capacity for saying positive things about those few facets, wait a second, about those many facets of the world that should be celebrated out loud, on the spot and at the time, if only on behalf of the young. Already, we are told, there are young people who can't sleep at night because they are convinced that before they reach adulthood the house they live in will be 20ft underwater and that Al Gore, at the tiller of his hydrogen-powered ark, may not have room for them and their families. If I can't generate the capacity to offset such nightmarish pressure on my own account, I'll try to borrow the capacity from others: people who, without being simpletons, nevertheless have the trick of sounding glad to be here. One of them is the aforesaid Australian painter Jeffrey Smart. He is getting on in years, as I said. He is already a bit older than he was when I started to introduce him at the beginning of this programme. But he is one of those men on whom age looks good. I won't start another digression about how bad age looks on me, because really I am glad to have lived so long, so why complain? Certainly Jeffrey Smart has the energy of a much younger man: much younger than me, in fact. Not that I'm complaining. He also writes very well, which is a bit steep when you consider how well he paints. Once, when he was quizzed about the high-rise skylines and the airport technology that so often form his subject matter, he said something that I wished I'd said. He said "The world has never been so beautiful". Now that's the kind of thing I've got to get better at saying. Because I've always felt that. 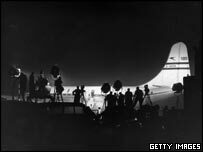 When I was still in short trousers I used to walk from my house near Botany Bay all the way to the airport so I could watch the Lockheed Constellations and the Stratocruisers come in from America and line up in front of the terminal. I found those first airliners of my life, long before I had ever stepped aboard one, as purely beautiful as I now find a late Beethoven quartet. A very late Beethoven quartet. Opus 131, for instance, is practically a musical rendition of a medium range British airliner called the Airspeed Ambassador, one of the loveliest things that ever flew. I got the same impression when I reached Italy in the early 1960s and hitched a ride in an Alfa Romeo along the beautifully engineered Austostrada del Sole, the Highway of the Sun. It was the built world that Jeffrey Smart has always loved to paint. Just at the very time when I was writing my first bad poems about the modern Italian landscape, Jeffrey Smart was painting his first good canvases on that very subject. I have a right to my sadness that my poems failed to convey the joy I felt. But all the more reason now to insist on the intensity of the joy. Nature is wonderful but human creativity is part of nature and the two things aren't necessarily at war. Of course we can't drive, fly and build anywhere and as often as we like. But not to be thrilled about what humanity can create is a kind of wilful sadness. I don't really suffer from it and I shouldn't allow it to be thought that I do. Perhaps I will just have to stand up more carefully under the open refrigerator door, just in case there is a young reporter waiting in the corridor whose world view will be irretrievably soured when I bleed all over him. "...a desperately unhappy and self-questioning paranoid sad-sack". You say that like it is a bad thing. I have to say that I am heartened upon Mr James's article above to find that there are people out there like me who see the beauty in our modern world. Beauty is all around us - and not just natural beauty, but man-made beauty too. I think it's all too often that we overlook the beauty of the built world because of its familiarity, when in fact if we look deeper, there is a lot to be seen and a lot to be inspired by. In a world where disaster and tragedy sell papers and tv programmes, it's no surprise that people tend to write from a negative point of view. If there's any good news or praise, people usually switch off and don't care. Any feel good stories are usually bumped for more interesting negative stories. It would be nice to hear someone of Clive's status writing from the brighter side of life for a change. Given the choice between optimism and pessimism, the pessimist has the more rewarding viewpoint. An optimist can never be happily surprised, while a pessimist is likely to be disappointed. I read an article recently that stated those people who are happy and joyful all the time are self-deluded - they see themselves as more attractive and powerful then they really are, see themselves having mroe effect on the world then they really do. Those of us who are cynical, miserable and depressed are that way because we see the world as it really is - we don't belive the happy politicians lies, we don't trust anything or anyone until they've actually done what they said they were going to do, we see exactly how little influence we have the world around us, and no matter how clever the advert is, it's not going to persuade to upgrade our phone/car/internet connection until we've read that indepth consumer report. We're not cynical, depressed misery-guts, we're clear-sighted, perceptive visionarys. So there. I think any one with a very dry sense of humour can be seen a bit miserable. But also I think it has a lot more to do with facial expressions( when in person)than anything else. Absolutely beautiful. I am so grateful to find the transcript. And yes, Johann Hari does sparkle and does drive one up the wall, but he will grow up - I assume. Oh - He's back!!! Joy of joys. A series of 10 - fantastic. Do tell Clive that I think he's wonderful, won't you ? Sunday mornings are back to what they should be. Don't let him get TOOOO serious, (not something I can imagine anyway :-)) Well done Radio 4 for bringing him back. You do get some things right. James frequently preens himself on his languages. He will need no help in What has happened to this program ? 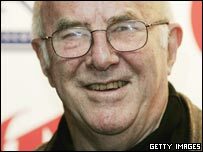 Did Clive James say he is presenting the next 10 programmes, well that 10 programmes I will not be listening to. Can we have some serious points of view from the likes of Brian Walden rather than this waffle.